Russia’s Anastasia Pavlyuchenkova, left, and Elena Vesnina congratulating each other after winning the match. 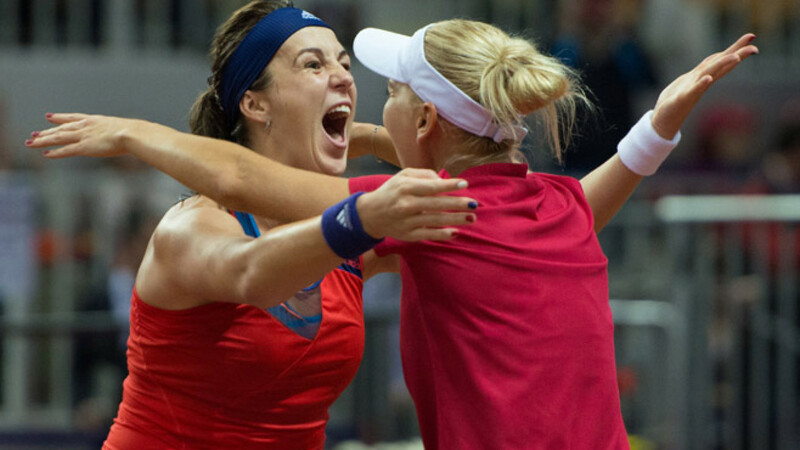 SOCHI — Russia reached the Fed Cup final Sunday, sealing victory at home over Germany in the last doubles rubber. Elena Vesnina and Anastasia Pavlyuchenkova won 6-2, 6-3 against Andrea Petkovic and Sabine Lisicki to stop a German comeback that had seen them recover from 2-0 down in the best-of-five tie after Saturday's play. "I was nervous, but I was nervous in a good way," said Vesnina, who was playing in her hometown, last year's Winter Olympic host city of Sochi. "Being a team is very important to us … and the home support also helped." As the Russians celebrated with a lap of honor waving the flag, Germany's Petkovic wept and was comforted by her teammates. "It was definitely a very disappointing stay [in Sochi]," Petkovic said. Russia's win sets up a match with defending champion the Czech Republic, which beat France 3-1. The final will be played in the Czech Republic on Nov. 14 and 15 because Moscow hosted the last meeting between the teams, when the Czechs won the 2011 final 3-2. The Czechs have won the Fed Cup in three of the last four years, while Russia is without a title since 2008. Earlier Sunday, Angelique Kerber leveled the score at 2-2 when she swept Russia's Pavlyuchenkova away in a 6-1, 6-0 win that lasted just 52 minutes. "I knew I had to go out there and just get the point. Obviously, I was a bit nervous," Kerber said. "I played aggressively from start to finish and I got energy from my team." Petkovic had beaten Svetlana Kuznetsova in straight sets to reduce Russia's lead over Germany to 2-1. Petkovic hit 20 winners as she won 6-2, 6-1 in 1 hour, 21 minutes, while Kuznetsova struggled, landing fewer than half of her first serves. Petkovic said she had fought exhaustion all week and was still only at 80 percent, so played aggressively to avoid the strain of a deciding set. "I don't want to know what would have happened if it would have gone three sets," she said. "It was very, very difficult, and even though it was a short match, I didn't feel great during the match physically." Kuznetsova said she was overwhelmed by Petkovic's aggressive style. "I couldn't get out of defense into attack," she said. German captain Barbara Rittner entered Petkovic and Kerber as overnight replacements for the reverse singles in place of Lisicki and Julia Goerges. On Saturday, Kuznetsova beat Goerges and Pavlyuchenkova defeated Lisicki, coming back from match point down to win. Russia's top-ranked player, Maria Sharapova, had been due to play in the tie but withdrew Tuesday citing a leg injury. Sharapova requires two more Fed Cup appearances to be eligible for next year's Olympics, but Russia captain Anastasia Myskina did not say if she would be considered for the final.